Here are some of the words I’ll use to talk about your work. If you want a word added to this lexicon please leave a note in the comment area below. I use the words “parent color” to indicate the main color or colors in a palette. 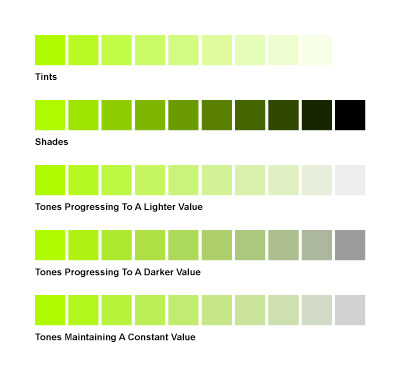 For example, the parent color of this monochromatic palette is a yellow-green with an HSB value of 82º, 100%, 100%. In this more complex tetrad palette, the parent colors are the four colors in the corners. Descendants are all the colors in the palette that are not parent colors.